On the 7th of April 1347 Charles IV, King of Bohemia and of the Romans, founded Charles University. The days in which the university jubilee culminated can be defined in sober or in flowery terms, and can be "prettified" by many adjectives. If I had to choose one word to characterize the human dimension of all these small, larger and "top brass" events, then that would would be "encounters". In one place, and in one segment of time, there were so many encounters between people who had never met, or had not seen each other for weeks, or long years. Experts, friends, new acquaintances, colleagues. Academics from every field, ministers, doctors, psychologists, nuclear physicists. From Europe, Prague, overseas. All of shared a common humility, which becomes people of great spirit. Their principles and ethics cannot be shifted even by what Mnacko famously called "the taste for power", and it is as clear to them as daylight that knowledge is power. In twos, threes and groups they kept up their discussions not only in formal sessions, but in the intervals, and breathing-spaces. In Czech, in English, in German. Over coffee, over a glass of white wine. It was hard not to be moved by the nobility of the spectacle of the nineteen distinguished scientists and scholars receiving their honorary degrees together. The faces of those who, one day later, were presented by the Rector of Charles University with Commemorative medals, were full of the experience of lifetimes spent in the pursuit of truth. Somewhere the real nestors of university life - among them Professors Fingerland, Vencovsky and Polisensky...These have genuinely devoted their entire careers to their Alma Mater. Their lives have not been easy, and they could teach their successors much about honour and pride in their university. To paraphrase the words of the charismatic French historian Jacques Le Goff in his address - it is people who make history, and the same is true of the history of universities. The theme of encounters is one that informs the small photo-feuilleton presented here and made up of shots taken on the margins of official ceremonies. They are eloquent testimony, and full of interest, since they are all about human encounters. 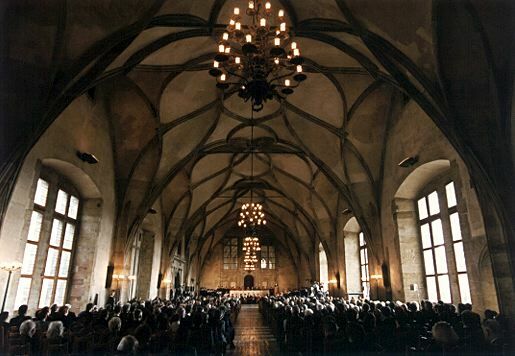 The Vladislav Hall of Prague Castle on the 7th of April 1998 - the academic community marks the 650th anniversary of its founding. The Throne Hall of the Prague Castle, the 3rd of April 1998, group photograph of the Charles University delegation with President Vaclav Havel. The work of artist Hana Capova: Charles IV (from the Carolinum exhibition of almost three hundred gifts from Czech artists to mark the 650th anniversary of CU). FORUM UK, a fortnightly magazine published by Charles University. Editorial office: Ovocny trh 5, 116 36 Prague 1. Telephone (+420 2) 24491348, (+420 2) 23491638, fax (+420 2)24491309. E-mail: forum@cuni.cz. Chairman of the editorial board: doc. Ing. Ivan Wilhelm, CSc., CU Pro-Rector. Editor-in-Chief and Head of the Department of External Relations: PhDr. Michaela Zindelova. Graphic design: Jiri Maleninsky and Jiri Stanek. Selection from Vol. IV, nos. 7-12 published in July 1998. Printing services by Hermes Press.